When Jesus takes the time to craft a story in which He walks, as both the Author and the Lead Character, it is worth remembering and retelling. Many stories in the Bible are told in a fleeting glance, almost as if the penman is flying past the stories as they happen. Then there are other stories, written in detail but from a distance. It is rare to see a story like this one in the Bible. This story was planned, as a living parable, before it was enacted. Then, it was told, as it was lived, at a walking pace. And it is remembered, as it was walked, by and with Jesus. Jesus often used current events to inform His storytelling. He was also quick to draw lessons from things that happened to Him or those around Him. But in this amazing story, it is clear upon reflection, that Jesus planned the entire event and it’s meaning before it was walked, talked and taught. Recorded in Luke 24:13-33, this story starts with two disciples of Jesus walking, ahead of Him, on the road. Imagine that, followers walking ahead of the leader. Surely, we would never do that! The two men do not know Jesus’ destination but they do know He started from Jerusalem like them because they are headed the same direction on the road to Emmaus. The Storyteller is crafting something special. In this verse, we are given the core purpose of this story, from the Teller’s perspective. The Author’s goal for the characters in the story is to recognise Jesus. What will it take to reveal the true identity of Jesus? At what point will the Divine Author reveal the third man to be Jesus? Adding conflict to the story, the goal of the Characters for themselves is a different goal. It is one which we often join with them in seeing as the primary goal of the story, most-likely because we so often relate to the men on the path — doubting their faith, their Saviour and their changing reality. They want to understand why: Why did Jesus die? Why had they believed a lie? Why had the meaning and purpose been sucked out of their lives? Why? Jesus joins them on the path, not to answer their questions, but to redefine the parameters. Have you ever asked “Why?” Why do bad things happen? Why didn’t God intervene? Why am I broken, used up and wasted? Why? Why? Why? God’s goal for us in our story is the same as the goal He sets in verse 16 for the characters of this story — that we may recognise Jesus. More than anything, it is God’s greatest hope that we will see Jesus. This story is for those who are walking away. It is for those who are searching. It is for those who are asking. God sends you a companion for the journey — so that you might see Jesus. From this point on, in the story, the hearer is challenged: When will these two men see Jesus as Jesus? What will it take? What needs to happen for people to recognise Jesus for who He really is? When Jesus catches up with them He asks a question. “What things?” Jesus asked (Luke 24:17-19). “What things?” This is such a powerful question, coming from Jesus. He is not asking what happened to Him in Jerusalem this weekend. He is asking what happened to them in Jerusalem this weekend. He is not asking what happened on the cross. He is asking what happened inside of them when they witnessed the cross. He is not asking for a factual recounting of the resurrection. He is asking for their view of the resurrection. Jesus want’s to know what His story means to them, where it has been misunderstood and what it is becoming within them. Because seeing Jesus through our eyes and seeing Jesus through God’s eyes are often very different things. And we become that which we behold. But they didn’t. It is so important, at this point, to remember the beginning of the story — Luke 24:16 — Jesus will be seen when He intends to be seen. He is shaping the story of a people. He is teaching them and us the way He wants to be remembered. Jesus has journeyed with us, joined our conversation and heard our story. Finally He speaks. He reminds us of the Old Testament teachings. He unpacks all that Moses and the prophets said about the nature of the true Messiah. In their own words, he causes “our hearts to burn within us” as he talks with us on the road and explains the Scriptures to us. Now both we and the two men understand who the Messiah was and is. You and I have heard the same sermon from a hundred pulpits. We know who Jesus is. In the story of this walk, the characters have reached their goal — they understand what has happened this weekend. But do they recognise Jesus yet? The Great Storyteller is still with them. The story continues. He has yet to reach His goal in the story. What is the Great Author doing? What is God waiting for? As they sat down to eat, he took the bread and blessed it. Then he broke it and gave it to them. Suddenly, their eyes were opened, and they recognized him (Luke 24:30-31). How would you react to a guest who did this? You’ve only just met him, he sits at your table, and when the food arrives he says, “I’ll pray!” Then he grabs the bread and blesses it. Jesus doesn’t ask. He takes over. And Jesus does something very memorable. Something they should remember well, because it’s only been four days since He did the same thing, in a different room, in front of them. He reawakens a recent memory by reenacting the upper room experience. Much like the upper room, He enters this house misunderstood and surprises them by his words and actions. On the night when he was betrayed, the Lord Jesus took some bread and gave thanks to God for it. Then he broke it in pieces and said, “This is my body, which is given for you. 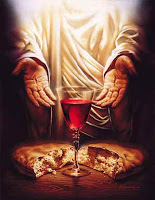 Do this to remember me.” In the same way, he took the cup of wine after supper, saying, “This cup is the new covenant between God and his people—an agreement confirmed with my blood. Do this to remember me as often as you drink it” For every time you eat this bread and drink this cup, you are announcing the Lord’s death until he comes again (1 Corinthians 11:23-26). A new covenant points to an old one — one revealed by Moses and the Prophets. The new covenant is confirmed by the cross and the empty tomb. How will we keep from forgetting the old and new and all they mean? By remembering Jesus. And how does the Great Author want us to remember Jesus? How does He want to be remembered? In what act did the Divine Storyteller reveal Jesus and tell us to announce “the Lord’s death until he comes again”? The two men on the road to Emmaus have been to Sabbath School and shared the story of their week and what they’ve experienced. They’ve been to church and heard the Word explained in perfection and completion — Jesus was the preacher! But Jesus waits. They still do not recognise Him. These things were not enough for the Great Author to fully revealed Jesus. They knew Jesus. They had walked with Him before His death. They knew all about Jesus. He had explained His death from the Scriptures. But they didn’t recognise Him in their midst. Jesus is to be remembered through the catalyst of communion. Bread and wine. Food and drink. Together. In the upper room, Jesus redefined the Exodus memory event — the traditional passover meal — into a commemorative meal of the New Covenant. Then in Emmaus, Jesus redefined every meal into a memory moment — the moment when we recognise Him among us. Whenever we eat together — at home, at church, at the park, in the office, at restaurants, on the road — we recognise Jesus is among us. We must eat with our family. We must eat with our leaders. And we must impress upon all followers of Jesus that to eat together, in remembrance of Him, is more important than we can ever hope to understand. It’s how Jesus wanted to be remembered.